Body Shield Trochanter Belt :: Braces & Supports :: Core Products Int., Inc. Body Shield is made from Breathe-O-Prene® foam. Breathe-O-Prene helps deliver oxygen back to the skin's surface, which aids in healing and tissue recovery. Constructed from a unique open cell foam material that provides the firm support and compression of neoprene, without the heat retention and skin irritation. Body Shield also wicks moisture and heat away from the skin, leaving the body cooler, drier and more comfortable. 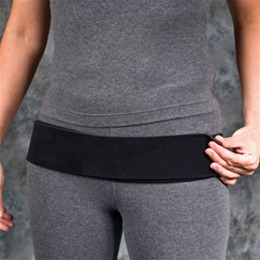 This belt stabilizes and compresses the trochanters and sacroiliac joints. It is best used following injury, hypermobility or during and after pregnancy. Black. Available in S/M, LG or XL.